Centered around a sparkling courtyard swimming pool, this 3 bedroom, 3 bathroom home radiates soul with every detail of the design considered. 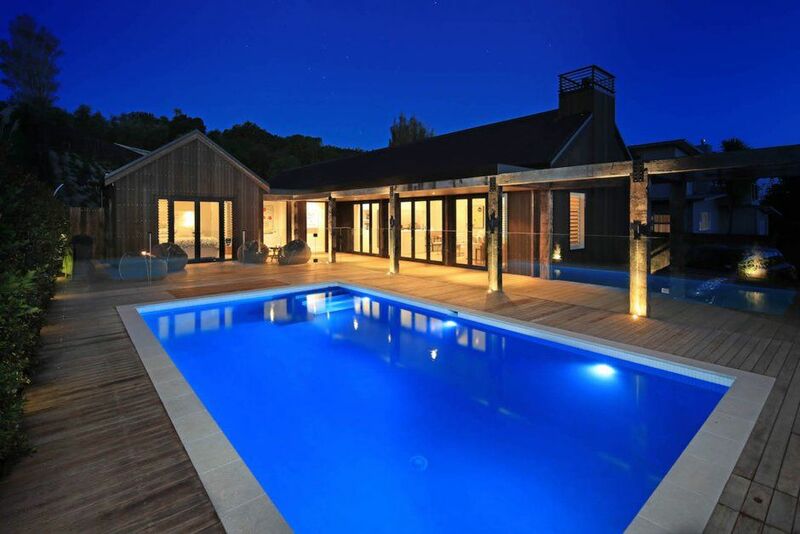 The open plan living/dining area with wood fire and professionally equipped kitchen opens to the spacious deck with outdoor dining/BBQ and sun loungers set around the pool. There are two double bedrooms and and two full bathrooms in the main house with the third double bedroom and third full bathroom in the self contained studio. A vehicle is available to hire with this property. Please enquire for rates and availability. At Stay Waiheke we offer a wide range of services for guests in residence including provisioning, private cheffing, beach towel hire, transport, tours, child minding and housekeeping. Advance bookings recommended. Please contact our team for assistance with your itinerary. Great spacious home, with great outdoor space for family fun. Excellent location close to beaches and less than 5 mins from passenger ferry. We had an amazing time super relaxing, I couldn’t fault this place in any way, I enjoyed it so much I’m re visiting again later in the year. Great modern house, excellent design and materials. Great modern house, excellent design and materials. Living area opening onto the pool was fantastic for the kids. Close to Oneroa shops and beach. We really oved our stay, thanks.